Established in 1990, A Rated Windows & Carports offers a wide range of canopies, which allows you to add that extra bit of style to your period property. 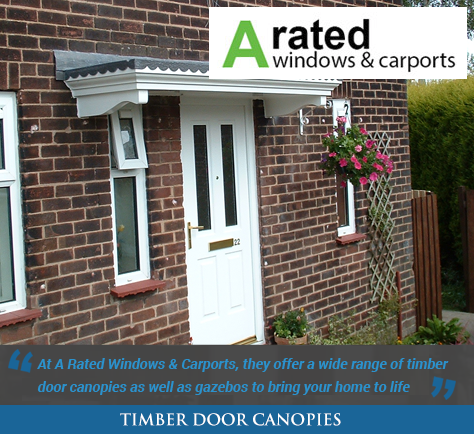 A Rated Windows & Carports stocks a wide range of timber door canopies, that fit in perfectly with period properties. As well as door canopies, A Rated Windows & Carports offers a range of log cabins which can offer an idyllic garden escape for you to enjoy in the summer months. Also, for those with doors opening up outside on the first floor they also provide Juliet balconies so you can enjoy your garden to the full possible extent. A Rated Windows & Carports always aim to ensure their growing product range is only from respected manufacturers, which offer quality throughout their products. To ensure you get amazing value for money, A Rated Windows & Carports offer their products at competitive prices so keeping your costs down.